The southern portion of the subcontinent has often followed a different course of development than the center and north. Here the non-Aryan Dravidians retreated, and here have been the loci of several large and powerful states. Currently, this listing memorializes the last two. Pallavas rose in power during the reign of Mahendravarman I (c.600 – 630 CE) and Narasimhavarman I (630 – 668 CE) and dominated the Telugu and northern parts of the Tamil region for about six hundred years until the end of the 9th century. Throughout their reign they were in constant conflict with both Chalukyas of Badami in the north and the Tamil kingdoms of Chola and Pandyas in the south and were finally defeated by the Chola kings in the 8th century CE. Their capital was Kanchipuram. He was the first Pallava monarch whose domain extended beyond Kanchipuram (Kanchi) in the South. He avenged his father's defeat at the hands of the Chalukya king, Pulakesi II in the year 642 CE. He destroyed the Chalukya capital at Vatapi. Narasimhavarman was also known as Mamallan (great wrestler) and Mamallapuram (Mahabalipuram) was named after him. Narasimhavarman I is claimed to be one of the Seven Indian kings who never lost on the battlefield to their enemies, the others being Karikala Chola of the Sangam age, Samudragupta, Chandragupta Maurya, Ashoka, Rajaraja Chola I, his great warrior son Rajendra Chola. Parameswaravarman was an efficient and capable ruler, known for his military exploits, his love for poetry and his devotion to Siva, to whom he erected many temples. Rajasimha's reign was marked by peace and prosperity, and he constructed several beautiful temples. Rajasimha's had two sons - Mahendravarman III and Paramesvaravarman II. However, Mahendravarman III predeceased his father and Paramesvaravarman II succeeded to the throne. Parameswaravarman died without any heir and hence the Pallava empire was kingless. Nandivarman was an intellectual with aptitude in many arts like writing, poetry, music and philosophy. He is known for his good looks and liking for training in gymnastics. Nandivarman then only 13 years old was not equipped physically and mentally to command an army and thereby the naturally imperialist pallavas for the first time in their illustrious history beat a tactical retreat. This however did not have a serious consequence and the pallava territories were never in any danger. The Eastern Chalukyas who had taken an antagonistic stand against the Rashtrakutas again had to face the wrath of Govinda III, who defeated Chalukya Vijayaditya II and installed Bhima Salki as its ruler. He further defeated the king of Kaushal (Kosala) and occupied parts of Andhra and defeated Pallava Dantivarman in 803 at Kanchi. Govinda III even obtained the submission of the King of Ceylon without even going to battle. Govinda III died in 814. Govinda III brother Indra during this time founded the Gujarat (Lata) branch kingdom. During the invasion of the Chola country, the Pandya king Varagunavarman II became an ally of Nripatunga, the eldest son of the Pallava king Nandivarman III. When Nandivarman died in 869, differences arose between Nripatungavarman and his stepbrother Aparajita, probably owing to the latter’s ambition to rule the kingdom on his own right. Both sides looked for allies. Nripatungavarman continued to have Varaguna Pandya by his side while Aparajita allied with the Ganga king Prithvipathi I and with Aditya Chola I. King Vijayalaya who understood that the Cholas would never be able to regain the kingdom if they lost this war somehow heard of this and arrived at the battlefield. He was 90 years old, had two hands, one leg and one eye. Aditya (son of Vijayalaya), Aparajita and the generals under Vijayalaya attack the Pandya army and this time there is no stopping them. Although the victor of the Sripurambiyam battle was Aparajita, the real gains went to Aditya I Chola. During 903 C.E., the 32nd year of his reign, Aditya I Chola, not satisfied with his subordinate position, planned and carried out an attack on his erstwhile overlord, the Pallava king Aparajita. In the battle that ensued, Aditya pounced upon Aparajita when he was mounted on an elephant and killed him. That spelt the end of the Pallava rule in Tondaimandalam (north Tamil Nadu) and the whole of the Pallava kingdom now became Chola territory. This spelt the effective end of the once great Pallava empire in the history of South India. Vijayalaya was the Chola king of South India who captured Thanjavur during c. 846 C.E. and re-established the Chola dynastic rule. Thanjavur became the capital of this empire. He extended the Chola dominions by the conquest of the Pallavas. Parantaka continuing the expansion started by his father, invaded the Pandya kingdom in 910. He captured the Pandyan capital Madurai and assumed the title Madurain-konda (Capturer of Madurai). The Pandyan ruler Maravarman Rajasinha II sought the help of Kassapa V, the king of Sri Lanka, who sent an army to his aid. Parantaka defeated the combined army at the battle of Vellore. The Pandya king fled into exile in Sri Lanka and Parantaka completed his conquest of the entire Pandya country. Besides Rajaditya and Arinjaya, Parantaka had three more sons: Gandaraditya, Arikulakesari and Uttamasili. He had at least two daughters: Viramadevi and Anupama. Uttamasili does not appear to have lived long enough to succeed to the Chola throne. Parantaka II ascended the Chola throne despite the fact that Uttama Chola, the son of Gandaraditya, (the elder brother of Arinjaya) was alive and he had equal if not more claim to the Chola throne. He was the eldest son of Parantaka II and the brother of Rajaraja Chola I. He was born as Arulmozhi Cholan (also called as Periya Udayar). One of the greatest emperors of the Tamil Chola Empire and India, who ruled between 985 and 1012 CE. He established the Chola empire by conquering the kingdoms of southern India expanding the Chola Empire as far as Sri Lanka in the south and Kalinga (Orissa) in the northeast. His Bronze Starter, Silver Kahavanu and Gold Kahavanu coins are well known in numismatic world. During his reign, he extended the influences of the already vast Chola empire up to the banks of the river Ganges in the north and across the ocean. Rajendra’s territories extended coastal Burma, the Andaman and Nicobar Islands, Lakshadweep, Maldives, conquered the kings of Srivijaya (Sumatra, Java and Malaya in South East Asia) and Pegu islands with his fleet of ships. He defeated Mahipala, the Pala king of Bengal and Bihar, and to commemorate his victory he built a new capital called Gangaikonda Cholapuram. He maintained the Chola authority over most of Lanka, Vengi, Kalinga and the relations with overseas domains despite a series of revolts in the territory. He had fought a protracted battle with the Chalukyas during which he lost his own life. Rajendra II, who had been nominated by his elder brother Rajadhiraja Chola I as heir apparent over his own children, proclaimed himself king on the Koppam battlefield after his victory. Rajendra then pressed on his army up to Kolapur, in modern Maharashtra, where he planted a pillar of victory and returned to Gangaikonda Cholapuram. Most under-rated Chola kings, mainly because of the fact that a major part of his life was spent in the apprenticeship of his two elder brothers. His reign was marked by civil unrest, possibly religious in nature, in which he was killed. With the death of Athirajendra Chola, the Chola dynasty of Vijayalaya Chola came to an end and rulers after him were known as Later Cholas. The Chalukya Chola prince Rajendra succeeded him as Kulottunga Chola I. He was son Rajaraja Narendra (Chalukya). The Chola kingdom was at its greatest extent under Kulottunga I in his forty-fifth reignal year. Except for the loose hold over Lanka, the rest of the empire remained intact. During his reign the Chola country suffered from severe floods and the resultant draught. Most of the northeastern provinces were affected by this calamity. Vikrama Chola made his heir apparent and coregent in 1133. Therefore the inscriptions of Kulottunga II count his reign from 1133. Kulottunga II reigned over a period of general peace and good governance. There is no record of any warfare except for the consolidation of the Chola control over the northern Vengi territories, which had been won by his father Vikrama Chola by routing the Western Chalukyas. The extent of the Chola territories remained as they were during Rajaraja's predecessors. The Vengi country was still firmly under the Chola rule. However the feudatory Telugu Chola chieftains of Velanadu began to assert their independence more and more. He reigned as the Chola king succeeding Rajaraja Chola II. He was not the direct descendant of Rajaraja Chola II, but a grandson of Vikrama Chola by his daughter. Rajaraja Chola II chose Rajadhiraja as his heir as he did not have any sons of his own. Soon after the installation of Rajadhiraja II, a fierce succession dispute in the Pandya country led to the intervention of the Chola and the Sinhalese rulers on opposite sides which brought misery to both. Out of the ashes of this civil war arose the Pandya power which in its renewed strength soon swallowed both the Chola and Sinhalese kingdoms. The inscriptions of Kulottunga show that his rule commenced around July 8, 1178 CE. Kulottunga was recognised as the next sovereign even before the death of his predecessor Rajadhiraja Chola II. Kulottunga III did not belong to the direct line of the Cholas. His long reign was marked by Kulottunga's abilities to bring order in the besieged kingdom and by his successes in reversing the growing weakness. However towards the end of his reign, the Pandya Maravarman Sundara Pandya defeated Kulottunga and made the Chola subordinate to Pandya rule, thus marking the beginning of the final demise of the Cholas. Kulottunga III is also renowned for his patronage of art and literature. He is credited with the building of numerous temples and continued to rule till 1218. He succeeded Kulottunga Chola III on the Chola throne in July 1216 CE. Rajaraja came to the throne of a kingdom much reduced in size as well as influence. With the rise of the Pandya power in the south, the Cholas had lost most of their control of the territories south of the river Kaveri and their hold on the Vengi territories in the north was slipping with the emergence of the Hoysala power. Rajaraja III however continued to live until 1260. He came to the Chola throne in 1246 CE. Although his father Rajaraja III was still alive, Rajendra began to take effective control over the administration. Rajendra was a much abler king than his father and tried to stop the rapid decline the Chola kingdom was experiencing due to the incompetence of Rajaraja III. In the end these efforts were in vain, mainly due to the cunning shift in policy of the Hoysalas, and the struggling kingdom could not withstand the vigour of the Pandyas and was eventually absorbed within the Pandyan kingdom. Jatavarman Sundara Pandyan, who ascended the throne in 1251 was first concentrating on the Chola-Hoysala wars, and once he had control of Uraiyur and Thanjavur, he promptly won back Kanchi from Ganapati and Gandagopala in 1258 and restored Kanchi to Kopperinchungan-II. However, the Kadava Pallava Kopperinjungan II was followed by very weak successors and Jatavarman annexed Kanchi, Nellore and Visayavadai (modern Vijayawada) regions to the Pandiyan Kingdom. This was followed by an expedition personally led by Jatavarman along with Vira Pandiyan to Kalinga and resulted in both Kalinga and Vengi coming under the Pandiyan control. However, the Pandyas also faced hostility from the Hoysalas during this period, and were unable to completely control Chola territory as a result. Chola also disrupted by defeat at the hands of the Delhi Sultanate. Portions of the state annexed to Delhi, while other areas fall into the hands of provincial rulers. Eventually, Vijayanagar ("City of Victory") emerges as the chief center of independent Hindu resistance to Muslim control of most of India. Following the disruption of the Karnataka state, a second power emerged in southern India under the Sangamas - Vijayanagar. This empire was a dominating force in the region from c. 1375 to 1565. Copper jital Bull type, Bronze kasu Madurai, Silver tara (2.5 rattis), Silver 10-rattis and Gold Pagoda are well known coin denominations of this dynasty. He was Bhavana Sangama’s eldest son, belonged to the yadav clan and was founder of the Sangama dynasty. he was administering the northern parts of present day Karnataka from his seat at Gutti, Ananthpur district in 1339. He initially controlled the northern portions of the Hoysala Empire before taking full control over its entire range after the death of Hoysala Veera Ballala III in 1343. Kannada inscriptions of his time call him Karnataka Vidya Vilas (master of great knowledge and skills), Bhashegetappuvarayaraganda (punisher of those feudatories who don't keep their promise), Arirayavibhada (fire to enemy kings). Among his brothers, Kampana governed Nellur region, Muddppa administered Mulabagalu region, Marappa oversaw Chandragutti and Bukka Raya was his second in command. Bukka Raya conquered most of the kingdoms of southern India, continually expanding the territory of the empire. He defeated the Shambuvaraya Kingdom of Arcot and the Reddis of Kondavidu by 1360 and the region around Penukonda was annexed. Bukka defeated the Sultanate of Madurai in 1371 and extended his territory into the south all the way to Rameswaram. His son, Kumara Kamapna campaigned with him and their efforts were recorded in the Sanskrit work Madhuravijayam written by his wife Gangambika. By 1374 he had gained an upper hand over the Bahmanis for control of the Tungabhadra-Krishna doab and also took control of Goa, the kingdom of Orissa (Orya) were also captured and Bukka forced the Jaffna kingdom of Ceylon and Malabar to pay tributes to him. During his reign Bukka would also have clashes with the Bahmani Sultans. The first was during the time of Mohammed Shah I and the other during the time of Mujahid. He patronised Kannada poet Madhura, a Jaina. An important work on Vedas was completed during his time. He earned the titles Vaidikamarga Sthapanacharya and Vedamarga Pravartaka. During his reign, Harihara II continued to extend the kingdom's territory through fighting against the Reddis of Kondavidu for control of the coastal Andhra between Nellore and Kalinga. From the Reddis of Kondavidu, Harihara II conquered the Addanki and Srisailam areas as well as most of the territory between the peninsula to the south of the river Krishna, which would eventually lead to fights in Telangana with the Velamas of Rachakonda. Harihara II took advantage of the death of Mujahid Bahmani in 1378 and extended his control into the northwest, controlling such ports as Goa, Chaul, and Dabhol. Harihara ruled from the capital Vijayanagara now more popularly known as Hampi. With the death of Harihara II, the throne for the Vijayanagara Empire was disputed among his sons, including Deva Raya I, Bukka Raya II, and Virupaksha Raya. Virupaksha Raya could only rule for a few months before being murdered by his sons and then succeeded by Bukka Raya II, who ruled for two years and replaced by Deva Raya I. As his rule was only for a few months, Virupaksha's reign was not marked with any significant events or changes, though it is noted by the traveler Fernao Nuniz that Virupaksha Raya lost a lot of the kingdom's land to the Muhammadans such as Goa, Chaul, and Dabhol and that Virupaksha himself was cruel and as Nuniz wrote, "caring for nothing but women and to fuddle himself with drink". Like his grandfather Harihara II, he patronised the Jain Kannada poet Madhura. During his rule, a dispute over property between the Shanka Jainalya of Gadag district and the Somesvara temple trust within the palace was settled amicably. After Harihara II died there was a dispute between his sons for the throne of the Vijayanagara Empire in which Deva Raya I eventually come out as victor. Throughout his reign, Deva Raya was continually fight against the Velamas of Telangana, the Bahmani Sultan of Gulbarga, and the Reddis of Kondavidu and the Gajaptis of Kalinga. Even so, Deva Raya was be capable of managing the vast amount of territory that he controlled. After his death, Deva Raya was be succeeded by his sons Ramachandra Raya and Vijaya Raya.European traveller Nicolo Conti travelled to Vijayanagara during this time and described the city being 60 miles in diameter. Perhaps the greatest of the Sangama dynasty rulers, he patronised some of the famous Kannada and Telugu poets of the time. Kannada poets like Lakkana Dandesa, Chamarasa, Jakkanarya and Kumara Vyasa and among Telugu poets Srinatha, who was bathed in a shower of gold coins (tankas) were the most famous. It is said that Srinatha held the same position in his court as senior ministers and moved freely with the emperor. The King himself was a scholar and wrote Sobagina Sone in Kannada and Mahanataka Sudhanidhi in Sanskrit. Unlike his father, Deva Raya II was an effective and successful monarch. During his reign, Deva Raya II prevailed over his conquest of Kondavidu in 1432, repelled the invasions of Ahmad Shah I of the Bahamanis and retained the Mudgal fort in 1436 but lost some areas in the Raichur doab in 1443, defeated the Gajapati of Orissa three times in 1427, 1436 and 1441, restored the Reddi Kingdom of Rajamahendri to its former position, fought against the Sultan Ala-Ud-Din (centered around the forts of Mudgal and Raichur in the Krishna - Tungabhadra doab), and continued onwards to Kerala where he defeated the ruler of Quilon as well as other chieftains. He invaded Lanka and collected rich tributes there. The ruler of Calicut and even the kings of Burma ruling at Pegu and Tanasserim paid tributes. This information was obtained from the writings of Nuniz. Abdul Razzak, the Persian ambassador who visited southern India in 1443 wrote that overall Deva Raya II has extended the Vijayanagara Empire from Orissa to Malabar, and Ceylon to Gulbarga as well as taking over multiple ports of South India. Even so, the issue with the Bahmani kingdoms had not yet been resolved and the two kingdoms continued to be hostile to each other throughout Deva Raya II's reign. Bahamani invasions were unsuccessful and eventually drove the Bahamani monarch Ahmad Shah I to move his capital to Bidar during his invasion of the empire in 1426. By the end of his reign, Deva Raya II had succeeded in conquering all of South India as well as sending the empire into a golden age of prosperity. It was during this time that the explorer Nicolo Conti and Persian chronicler Abdur Razzak travelled here. Mallikarjuna Raya was unlike his father, and was generally a weak and corrupt ruler. At the beginning of his reign he defended the kingdom from the attacks of the Bahamani Sultan and the Gajapati Emperor of the Hindu empire of Kalinga-Utkal Orissa, which then stretched from the Ganges to the Cauvery, but thereafter it was marked by a string of defeats: the Gajapatis conquered Rajamahendri in 1454, Udayagiri and Chandragiri in 1463 and the Bahamani kingdoms took over much of the Vijayanagara Empire by 1450 and grew closer to the capital, while at the same time the Portuguese arrived in southern India, seizing many of the ports on the western coast that the Vijayanagara Empire had once controlled. These events eventually led to the decline of the Sangama Dynasty; Mallikarjuna Raya's cousin Virupaksha Raya II took the opportunity to seize the throne, though he failed to prove a better ruler. Throughout his reign, Virupaksha was faced with rebellious nobles and officers as well as multiple enemies who began to invade the weakened kingdom. It was during this time that Virupaksha Raya II lost the Konkan coast (including Goa, Chaul, and Dabul) by 1470 to Prime Minister Mahamud Gawan from the Bahamani kingdom, who was sent to conquer the area by the Sultan Muhammad Shah III. The Bahmani Sultan would also invade Doab of Krishna and Tungabhadra, and the Raja Purushottama Gajapati of Orissa invaded Tiruvannamalai. Because of these losses, Virupaksha became increasingly unpopular and ignited many of the empire's provinces to rebel, eventually leading up to Virupaksha's death in the hands of his own son, Praudharaya in 1485. Praudharaya himself was not able to salvage the kingdom but fortunately, an able general Saluva Narasimha took control of the empire in 1485 and helped to prevent its demise, though this change of power would mark the end of the Sangama Dynasty and the beginning of the Saluva Dynasty. By 1491, he lost Udayagiri to Gajapati Kapilendra of Orissa while the Chiefs of Ummattur in the Mysore region, Saluvas of Hadavalli and Santharas of Karkala from coastal Karnataka region, Srirangapatna and Sambetas of Peranipadu in Cuddapah still remained threats to the empire. Saluva Narashima's war with the Gajapatis over Udayagiri in 1489 proved disastrous when he was taken prisoner and released later after giving up the fort and surrounding areas to the Gajapatis of Orissa. However he was successful at conquering the western ports of Kannada country of Mangalore, Bhatkal, Honnavar and Bakanur. This success enabled him to trade for swift horses with the Arabs. He took more efforts in the upkeep of his cavalry and army in general. Saluva Narashima eventually died in 1491. However, at the time, his sons were too young to ascend to the throne. Because of this, the sons were left to the care of Narasa Nayaka, a loyal general and minister from the Tuluva family. He was the elder son of Saluva Narasimha Deva Raya, but was soon murdered by an army commander during a period of political unrest in Vijayanagara. He was succeeded by his younger brother Narasimha Raya II. Though he was a crowned king of Vijayanagara Empire, the real power lay in the hands of the empire's able commander Tuluva Narasa Nayaka. Tuluva Narasa Nayaka was murdered in 1503 and his eldest son Viranarasimha Raya became the regent of the empire. In 1505, Immadi Narasimha Raya II was murdered in Penukonda and Viranarasimha Raya proclaimed himself king. He successfully kept the Bahamani Sultans and the Gajapatis away from the kingdom and quelled many rebellions by unfaithfull chieftains, trying to exert their independence. During the time 1463 when Vijayanagar was ruled by Saluva Narasimha, the region south of Kaveri river had slipped out of Vijayanagar control when the king was busy protecting interests closer to the capital. In 1496, Narasa Nayaka marched south and brought under control rebellious chiefs like the governor of Trichi and Tanjore. The whole area south of Kaveri to Cape Comorin was brought under control. The chiefs of Chola, Chera, Madurai area, Heuna or Hoysala chief of Srirangapatna and Gokarna on the west coast were brought under Vijayanagar empire control in one long successful campaign which ended in 1497. In 1496, Gajapati king Prataparudra attacked Vijayanagar and advanced up to Pennar but Narasa Nayaka held out and succeeded in a stalemate. Narasa Nayaka wasted little time in stabilizing the kingdom. The Bahamani kingdom by now was breaking up into smaller independent chiefdoms. Qasim Barid, a Bahamani minister offered Narasa Nayaka the forts of Raichur and Mudgal in return for help in defeating Yusuf Adil Khan of Bijapur. According to writings by Ferishta, Narasa Nayaka sent an army to the Raichur doab area that devastated the area in the doab. Yusuf Adil lost this part of the doab and repeated attempts to recover it failed. Having failed to defeat him in battle, Yusuf Adil Khan invited Narasa Nayaka to Bijapur on a peace offering and had Narasa Nayaka and seventy high ranking officers murdered. Viranarasimha Raya was next crowned in 1505, after serving as regent 1503-1505 and spent all his years fighting rebel warlords. Yusuf Adil Khan of Bijapur tried to extend his domains south of the Tungabhadra. The Vijayanagar regent was supported by Ramaraja of the Aravidu family and his son Thimma. With their help, Adil Khan was defeated and pushed back. Adoni and Kurnool area became a part of Vijayanagar Empire. During this time, the chief of Ummattur was again in revolt and Viranarasimha Raya set out south to quell the rebellion, having placed Krishnadevaraya as the ruler in absence. Concerted efforts by Viranarasimha Raya to quell the rebellion in Ummatur had mixed results. Portugal assisted king Raya's forces in this conflict, providing horses and artillery, in exchange seeking control of the port of Bhatkal. He was half brother of Viranarasimha Raya. In some inscriptions he was famed Emperor of the Vijayanagara Empire at its zenith. He is regarded as an icon by many Indians. The Vijayanagar army laid siege to the Udayagiri fort in 1512. The campaign lasted for a year before the Gajapati army disintegrated due to starvation. Krishna Deva Raya offered prayers at Tirupati thereafter along with his wives Tirumala Devi and Chinna Devi. Peace was finally secured through diplomacy and the king Krishnadevaraya married the daughter of the Gajapati emperor Prataparudra deva called jaganmohini. Timmarusu had wisely foreseen the disastrous consequences of the defeat of Krishnadevaraya in Kalinga. The defeat would have spelled doom for Vijayanagara, for which the biggest threats still were the Muslim Bahamany and Golconda kingdoms. Thereafter peace between the two strongest Hindu empires in India ensured a period of harmony and the safety of Sanatana dharma in India. He established friendly relations with the Portuguese, who set up the Portuguese Dominion of India in Goa in 1510. The Emperor obtained guns and Arabian horses from the Portuguese merchants. He also utilized Portuguese expertise in improving water supply to Vijayanagara City. The complicated alliances of the empire and the five Deccan sultanates meant that he was continually at war; in one of these campaigns, he defeated Golconda and captured its commander Madurul-Mulk, crushed Bijapur and its Sultan Ismail Adil Shah and restored Bahmani sultanate to Muhammad Shah. The highlight of his conquests occurred on May 19, 1520 where he secured the fortress of Raichur from Ismail Adil Shah of Bijapur after a difficult siege during which 16,000 Vijaynagar soldiers were killed. He was the younger brother of Krishna Deva Raya. He patronised Kannada poet Chatu Vittalanatha and the great singer Purandaradasa (Father of Carnatic music) and the Sanskrit scholar Rajanatha Dindima II. Upon his death, the succession was disputed. Ismail Adil Shah of Bijapur invaded and captured the Raichur doab. However the Gajapati's of Orissa and Quli Qutub Shah of Golconda were defeated and pushed back. Now Achyuta Raya along with his general Salakaraju Tirumala went on a southern campaign to bring the chiefs of Travancore and Ummatur under control. This they did successfully. Then they invaded the doab north of Tungabhadra and recaptured the forts of Raichur and Mudgal. His nephew, (sister's son) Sadashiva, finally became king while yet a child, under the regency of Aliya Rama Raya, a son-in-law of Krishnadevaraya. He was a weak ruler and six months later, Sadasiva, who was the nephew (sister's son) Achyuta Raya became king according to the laws of aliya santana which was prevalent among the Bunts caste to which tuluva dynasty belonged. "Aliya" Rama Raya and his brother Aliya Tirumala Raya were sons-in-law of the great Vijayanagara emperor Krishna Deva Raya. He also suppressed revolts of the chieftens of Travancore and Chandragiri. When the Nizam of Ahmednagar and Qutbshah of Golconda sought Rama Raya's help against Bijapur, Rama Raya secured the Raichur doab for his benefactors. Later in 1549 when the Adilshah of Bijapur and Baridshah of Bidar declared war on Nizamshah of Ahmednagar, Ramaraya fought on behalf of the Ahamednagar ruler and secured the fort of Kalyana. In 1557 Ramaraya allied himself with Ali Adilshah of Bijapur and Baridshah of Bidar when the Sultan of Bijapur invaded Ahmednagar. The combined armies of the three kingdoms defeated the partnership between Nizamshah of Ahmednagar and the Qutbshah of Golconda. This situation of Vijayanagar ruler constantly changing sides to improve its own position made the Sultanates form an alliance. Intermarraige between Sultanate families helped solve internal differences between Muslim rulers. This consolidation of Muslim power in the northern Deccan resulted eventually in the Battle of Talikota. He was the brother of the Aliya Rama Raya and son-in-law of Krishna Deva Raya. Along with another brother Venkatadri, the Aravidu brothers rose to prominence. When Aliya Rama Raya was killed in the Talikota battle in 1565, Tirumala immediately emptied the treasury and fled the capital to taking with him the Royal family and the minor crown prince Sadasiva Raya. He, after a few years of hardships, reestablished the Vijaynagar rule in Penukonda, in present day Andhra Pradesh. During this time the Southern Nayakas of Madurai and Gingee declared partial independence, while some others rebelled over Tirumala Deva Raya’s authority. His reign was marred with repeated attacks and loss of territories from his Muslim neighbours. In 1576, Ali Adil Shah lay siege to his fort in Penukonda for three months, but at the end Sriranga I bought out the Adil Shah’s Hindu lieutenants which helped his commanders defeat the Sultan’s army. Sriranga I generously spared the life of Murari Rao because of his brahminical origins. Sriranga I died in 1586, without an heir and was succeeded by his youngest brother Venkatapathi Raya (Venkata II). Despite the loss of territories, which was higher this time, Sriranga I also had a difficult time with his uncooperative brothers and noble men and continued to resist with limited resources as the Nayaks of Madurai and Gingee evaded on paying annual tributes. Around 1592 Venkata II shifted his capital from Penukonda to Chandragiri, which was further South near the Tirupathi hills. The indestructible Vellore Fort was used as a major base and second capital. He was nominated in 1614 by King Venkata II to succeed him as king of the Vijayanagara Empire in Southern India. Sriranga was supported by a faction headed by Yachama Naidu of Recherla Velama dynasty, one of the Venkata II's loyal viceroys and commanders, but was not favored by a set of nobles headed by Gobburi Jagga Raya. Thus Sriranga II was killed within four months of his accession, but one of his sons, Ramadeva, escaped from the massacre to become the next King of Vijayanagara, after winning a gruesome war of succession (Battle of Toppur) in 1617. Vacant - succession wars 1614-1617. Yethiraja, the brother of Jagga Raya, after losing the Toppur Battle, aligned with the Gingee Nayak and attacked Tanjore, but was defeated with the later ending as captive. Yethiraja waged on, until he reconciled with Rama Deva Raya, after giving his daughter in marriage. Things settled for the king after the death of the putative son in 1619. The Bijapur Sultan, taking advantage of the ravaging civil wars attacked Kurnool in 1620, but was sent back only to return in 1624 and taking that region completely. Rama Deva Raya, with no brothers and sons nominated his cousin Peda Venkata (Venkata III), grandson of Aliya Rama Raya, now governing Anekonda as successor and died on 1632, aged 30 after a troublesome rule of 15 years. His paternal uncle, Timma Raja, another brother of Sriranga II, thought himself to have a better claim, seized the government at Vellore Fort, compelling Venkata III to remaining in his native place Anekonda. The Nayaks of Gingee, Tanjore and Madurai declared support for Venkata III, while Timma Raja got support from no-one and was looked upon as a usurper. Timma Raja nevertheless made lot of trouble and civil strife continued until his death in 1635. Initially he was winning, until the King Peda Venkata (Venkata III)’s nephew, Sriranga III took to the field and beat Timma Raja with help from the Dutch in Pulicat, compelling him to accept Venkata III’s claim. Timma Raja was allowed some territories under his control, but stirred up trouble for a second time, only to be slain by the Nayak of Gingee in 1635. Peace was finally restored and Peda Venkata Raya or Venkata III returned to Vellore to take charge. On 22 August 1639 Francis Day of the East India Company obtained a small strip of Land in the Coramandal Coast from him in Chandragiri as a place to build a factory and warehouse for their trading activities. Venkata III had no son and was immediately succeeded by his treacherous nephew Sriranga III, who came to Vellore Fort after deserting the Bijapur camp. In 1646 Sriranga III collected a large army with help from Mysore, Gingee and Tanjore and met the Golkonda forces. The Muslim forces were losing, but later advanced, when consolidated by additional armies from Deccan. The war went on till 1652. Sriranga III spent his last years under support of one of his vassal chieftains, Shivappa Nayaka of Ikkeri, and was still hoping to retrieve Vellore from the Muslim forces. Thirumalai Nayak's treachery to Sriranga III made the Mysore ruler Kanthirava Narasa wage a series of ravaging wars with Madurai, later capturing the territories of Coimbatore and Salem, regions which were retained by Mysore till 1800. The Mysore ruler Kanthirava Narasa still recognised Sriranga as a namesake emperor. By the 1640's, Vijayanagar had all but vanished entirely, it's territories absorbed by to a large extent by the Kingdom of Mysore, as well as Hyderabad and the Mughal Empire. The capital was seized by the Sultans of Bijapur and Golkonda in 1646, though a last shadowy Viyanagaran king seems to have held on to some fragment of territory through the 1650's. Sriranga died in the late 1670s as an emperor without an empire, putting an end to over three centuries of Vijayanagara rule in India. By the 18th century, southern India had fragmented completely into local states alongside various European colonies, especially at Goa (Portuguese) and Pondicherry (French). After 1757, British influence was paramount, and the region followed general Indian history from then on. AE kasu. Year: 15th - 16th century. Weight: 3.42g. Metal: Copper. Edge: Plain. Diameter: 13.00 mm. Alignment: Medal. Mint: N/A. Obverse: Oil lamp figure facing left with two lines below it. 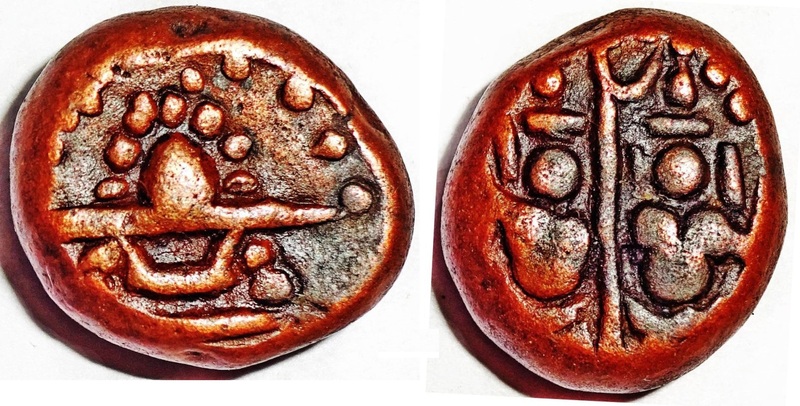 Reverse: Ram standing and Sita behind him. Minted Years: N/A. Ruler: probably Tuluva Narasa Nayaka. AE kasu. Year: 15th - 16th century. Weight: 3.08g. Metal: Copper. Edge: Plain. Diameter: 12.00 mm. Alignment: Medal. Mint: N/A. Obverse: Oil lamp figure facing right with one lines below it. Reverse: Ram and Sita figures seperated by a bar in the c enter. Minted Years: N/A. Ruler: probably Tuluva Narasa Nayaka. Vijayanagar Gold Bele. Year: 15th - 16th century. Weight: 0.03g. Metal: Gold. Diameter: 1.00 mm. Edge: Plain. Alignment: Rotated. Mint: N/A. Note: Image size increased 20 times to show some details. People that time, would swallow these gold pieces for save keeping and later retrieve them in a day or two.